Waterproof Box Connector offered by us is made using high quality material and as per the set industry standards. 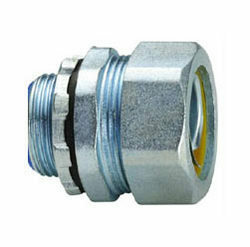 These connectors are one of the Liquid accessories / Liquid Tight Fittings that are an ideal tool for commercial and industrial uses including transformer connectors, air conditioning, and heating. The circular or hexagonal cross sectional area provides smooth connection and resists rough environment. Waterproof Box Connector is waterproof, durable, has no sharp edges to strip wire, and finds usage across different industries for various applications. Established in the year 1954, Flex Tubes is a leading manufacturer and exporter of Electrical Metallic Tubing Fittings, Flexible Conduits and Accessories. Our organization embodies an entrepreneurial journey that has spanned both old and new economics, building successful brick and mortar business to explore the new world of emerging technologies. All our endeavors are directed towards achieving complete customer satisfaction, which helps us in executing our business operations efficiently and more effectively. Our advanced manufacturing facilities and the assistance of highly qualified professionals ensures us to provide superior quality products at competitive prices. We follow the philosophy of harnessing resources to the optimal levels to ensure profitable business. Moreover, we follow self-explanatory model to evaluate self-performance and to identify opportunities for the betterment of the organization.